The changing colours of women - sister-hood magazine. A Fuuse production by Deeyah Khan. In this documentary women, men and young people talk about gender roles and sexism within the MENA region. The film addresses gender from many different perspectives and shows changing attitudes to women in the Muslim world. This video was produced by Womenquake – a movement founded by Sana Afouaiz, a Moroccan Muslim woman, that works for a better future for humanity. 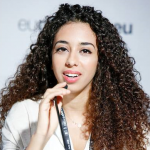 Sana Afouaiz is an award winning women’s rights advocate, and public speaker on global feminism and women issues. She has spoken in 40 countries at universities, panel discussions and international events. Sana reaches thousands of women each year, she uses her platform to voice the voiceless through story-telling, social campaigns and advocacy. She has organised several social campaigns including reforming a Moroccan law that allowed rapists to marry their victims to avoid jail. Sana’s mission is to challenge societal norms, spark conversions surrounding social taboos and lift the cover on unspoken realities in the MENA region.